Atmospheric, Oceanic, and Earth Sciences Dept. Malaysia Airlines Fl 370 mysteriously went missing southeast of Kuala Lumpur on 8 March 2014. In July 2015, a piece of wing from the same make and model of airplane was found washed up on the shores of Reunion Island, about 5000 km away (Washington Post, New York Times). 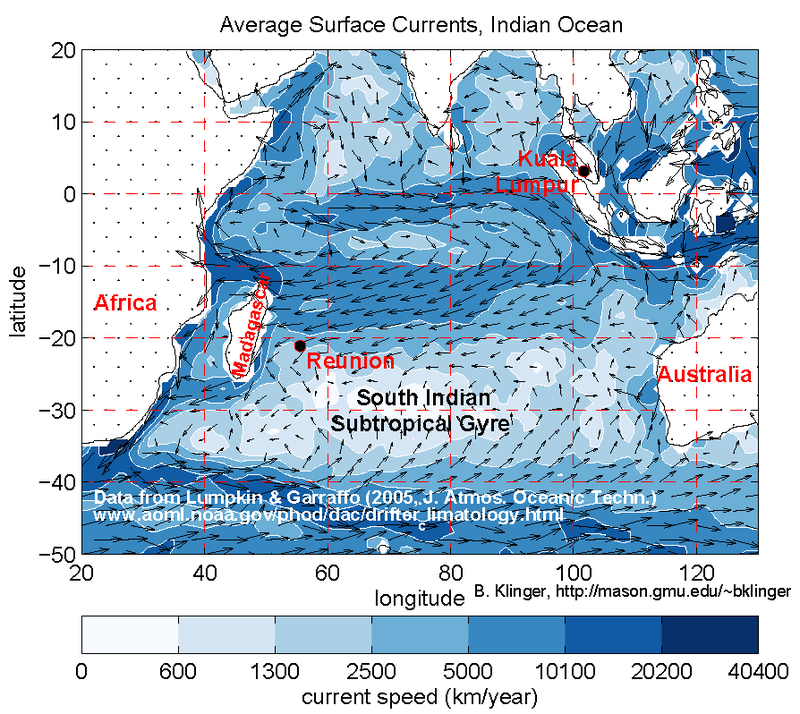 Is it plausible that ocean currents could bring it across almost the entire South Indian Ocean? The figure shows that it is plausible. Surface currents flow southward from the vicinity of Kuala Lumpur, and then swing westward as part of the counterclockwise Subtropical Gyre that dominates much of the South Indian Ocean. The jet is thought to have gone down further to the south, just west of Australia, but the Subtropical Gyre would bring debris from there to the same westward current. Thus the currents go in the right direction to bring the wreckage to Reunion. How about the time, about a one and a third years? As the color coding in the figure shows, speeds over the likely pathway range from over 2500 to under 10,000 kilometers per year. The wreckage speed of around 4000 km per year is consistent with speeds there. Higher Resolution PDF of Figure. Some other units for current speeds: 5000 km/year is equivalent to about 16 cm/s or about .36 miles/hour. Ocean currents over much of the ocean are slower than a human can swim - but they travel for far longer than a human swimmer can go! As a rule of thumb, 10o of latitude is equal to about 1,100 km (700 miles). Same for longitude at the equator, but the distance decreases as we go poleward, down to 80 km at latitude 45o. The wreckage of the flight has still not been found on the seafloor. If we have an accurate record of Indian Ocean currents over the last couple of years, we can in principle calculate the path that the debris took. This might narrow down the area for a renewed search for the plane. However, it is possible that the uncertainties in currents and in the precise timing of when the debris reached Reunion may still cause a large uncertainty in estimating its path. I graphed the data compiled and uploaded by scientists at the NOAA Atlantic Oceanographic and Meteorological Laboratory in Florida (AOML see figure for more detailed reference). The data is based on thousands of measurements of locations of instruments drifting in the ocean. The drifters are designed to sample the currents at about 15 m depth, which should be similar to the surface current. They radio their positions to satellites which forward the information to AOML. Drifter velocities are compiled for "small" boxes in latitude and longitude (about 100 km on a side) and then averaged for each box over all the drifter measurements conducted in that box over several years. The figure on this page also further smooths the data: for each box, the velocity is taken to be the average of that box and the eight neighboring boxes. Actual current velocities at any time differ from the temporal and spatial average, so for a more accurate estimate of a trajectory in the water you would need to use more detailed information, which can be estimated from a number of data sources and models. For more detailed information about the general circulation of the ocean, see the manuscript of my graduate-level textbook-in-progress, Ocean Circulation in Three Dimensions.